Flavonoids are a large and important group of natural products derived from 'flavone'. Some flavonoids are intensely coloured, providing a spectrum of colours from red to blue in flowers, fruit and leaves. Other flavonoids are essentially colourless, producing the 'whiteness' of white flowers. Besides their contribution to plant colour, flavonoids have a variety of other roles in the growth and development of plants. Leaf flavonoids provide protection from the potential damage of UVB radiation. Certain flavanones are formed as antifungal barriers in plant leaves in response to microbial infection and others play an important part in plant reproduction. Flavonoids also exhibit a wide range of biological properties including anti-microbial, insecticidal and oestrogenic activities. Edited by one of the world's acknowledged leading researchers in flavonoid chemistry and biochemistry, this book is the essential guide to the chemical structure and function of all known flavonoids and contains full references, CAS numbers, chemical structures, molecular formulae and several extensive indexes. 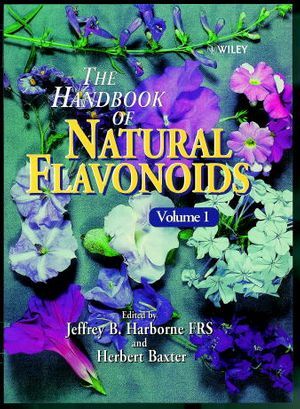 The Handbook of Natural Flavonoids is the definitive reference to this large and important group of natural products for researchers in pharmaceutical and medicinal chemistry, plant biochemistry and organic chemistry. Jeffrey Barry Harborne FRS was a British chemist who specialised in phytochemistry. He was Professor of Botany at the University of Reading, then Professor emeritus. Herbert Baxter is the editor of The Handbook of Natural Flavonoids , 2 Volume Set, published by Wiley.